What if you could predict the future? It may not be as impossible as it seems. In this exclusive talk, participants will learn five “non-obvious” habits to curate ideas and see what others miss. 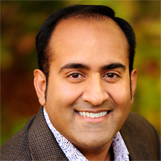 Based on his #1 best-selling annual trend series read by more than half a million people online, Rohit Bhargava will also share some specific trends from his 7+ years of research that matter for your industry … along with highly actionable ideas for how to use them. Predicting the future is a learnable skill – and this keynote will reveal exactly how to do it. (Note – the selected trends in this talk are typically customized by industry and specifically chosen based on relevance for the audience). We are living in a time when it is harder to earn trust than ever before. People skip ads, mistrust brands and believe government and institutions are manipulating them. People disagree on what “facts” actually are. So what does it take to build trust in the midst of this modern believability crisis? This entertaining and funny talk will reveal the five fundamental secrets of building trust and what it really takes to stand out as real, human and trusted in an untrusting world. Why do employees follow some leaders and not others? What separates brands that have true loyalty and even love from their customers and those that desperately cling to promotions to entice unwilling buyers? Based on years of work advising some of the largest brands in the world on strategy, this talk based on the best-selling book, Likeonomics, will offer a framework for how to be more likeable and why that makes such a difference in driving real brand loyalty. People respond to stories, and they love human brands with personality. Authenticity is certainly a buzz word in marketing today, but the power of being more human and approachable is critical today for brands and leaders alike. This talk goes behind the scenes of some of the most beloved companies in the world to offer a blueprint for any brand or leader to find their voice, craft a better story, and share it with the world. Over the past 18 years, Rohit Bhargava has advised hundreds of global brands as a former executive at two highly respected marketing agencies (Ogilvy and Leo Burnett). He has a reputation for seeing and executing on innovative ideas before they become mainstream. At Leo Burnett, he helped start the agency's first digital team in Australia back in the year 2000. At Ogilvy, he was a founding member of one of the first Agency groups dedicated to social media strategy, and a team that eventually grew to be the world's largest such group, advising brands such as IBM, Marriott, American Express, and Intel. He is a citizen of dual countries (USA and Australia) and has lived and worked in multiple countries. Since leaving the corporate world to become an entrepreneur, Rohit has founded multiple companies focused on inspiring more innovation, publishing trend research, and delivering strategic advice to some of the biggest brands in the world. While never becoming a full-time sheltered academic, Rohit is a popular Adjunct Professor at Georgetown University in Washington, D.C. teaching signature courses in digital marketing strategy and persuasive storytelling + pitching. Always a prolific writer since earning his Masters in English, Rohit is the author of five best-selling business books including the Wall Street Best Seller Non-Obvious. He has won the prestigious Gold Atticus award for thought leadership and his books have been translated into ten languages. He is a two-time TEDx speaker and routinely rated among the top speakers in the world on marketing, branding, innovation, digital strategy and actionable business trends. His signature trend research report (published annually in December) is called the Non-Obvious Trend Report and has been read and shared over a million times. Due to his reputation as an entertaining, humble and non-boring keynote speaker, Rohit has been invited to headline events in 31 countries around the world where his popular talks have inspired audiences from 10 to 10,000 people. When working with event planners, he prides himself on going above and beyond delivering a great experience on stage to truly BE part of an event and do anything he can to make it successful, from sharing drinks with attendees after he speaks to helping promote an event to his significant social media following. "Bhargava made much of how important it was to curate one’s own ideas rather than simply collecting and regurgitating those of others. With that in mind, therefore, this reporter is taking a leaf from his book by curating a list of his own top takeaways from what was a highly entertaining and insightful talk on the opening day of SXSW Interactive 2019. Guess what? This list only includes six!"